Price reduced on this beautiful 65' Ocean Odyssey yacht for sale! : Atlantic Yacht & Ship, Inc. If you are in the market for a beautiful 65′ used Ocean Odyssey yacht for sale then you must check this yacht out! It features a beautiful 65′ used Ocean Odyssey Yacht that Brent DeSellier has for sale in Florida! Known as the “Odyssey model”, this 65′ used Ocean Odyssey yacht is the lowest priced on the market! She features an extremely spacious three stateroom & three head layout. Furthermore, she has a full-size laundry room. A fourth stateroom could easily be made from it! With a knowledgeable owner, captain, and crew, this vessel has been well kept and maintained. Moreover, this Ocean yacht is equipped with the very fuel efficient 900HP DDC MTU diesel engines. And therefore you get approximately 24 knots cruise burning roughly 64 GPH. 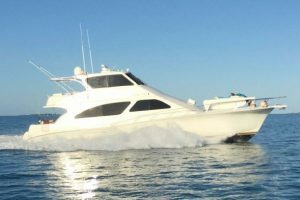 Comparatively, this 65′ used Ocean Odyssey yacht for sale is a plush motor yacht built on the foundation of the Ocean Sport Fish model. After all, this combines the luxury of a motor yacht with the speed and ability to handle rough water. She sleeps a total of six owners/guests in her three staterooms and 2 more guests can be accommodated in the saloon on the convertible sofa-bed bringing the total to 8 guests. For more information on this beautiful used 65′ Ocean Odyssey yacht for sale be sure to contact Brent DeSellier today!